A New Horizontal Shaft Impactor is Saving Money and Maintenance as a Shale Crusher for General Shale Brick's Mooresville, IN Operation. By Dennis Gilmour, President, Stedman Machine Company. General Shale Brick LLC’s previous grinder caused long downtime, lost production and could not process the oversized aggregate found in the shale. The company began to search for a limestone crusher that would be able to handle the oversized rocks and decided on a Stedman horizontal shaft impactor. This shale crusher easily handles General Shale’s larger shale feed material and increased production. Photo, General Shale produces more than 250 types of face brick for residential, commercial and industrial construction. Headquartered in Johnson City, Tenn., General Shale Brick LLC is one of the leading exterior building materials manufacturers in the U.S. The company produces a variety of products, including paving brick, landscaping materials, concrete blocks, lightweight aggregate and sand. But its primary focus is producing more than 250 types of face brick for residential, commercial and industrial construction. General Shale's Mooresville, Ind., operation alone supplies approximately 105 million bricks per year-around two million bricks each week-to a market within a 500-mile radius of the plant. A few years ago, the Mooresville plant realized it had an efficiency problem. It was using an old American Clay 384 grinder to crush hundreds of yards of shale each day into the raw material used for brick production. The grinder was originally built in 1929 and installed in the Mooresville facility in 1969. Even though it had been recently rebuilt, spending 9, 18-hour days to complete, maintenance time requirements and costs, as well as, downtime from production limitations, were costing the plant a fortune. General Shale Brick went through a 55-gallon drum of 680-cylinder oil each month to lubricate the grinder. The grinder's pan-bottom and tires required replacing a couple of times each year, an operation that took three to four men an entire day and cost the company approximately 800 cubic yards each time in lost production. In addition, the company lost an average of 10 minutes of production each time the grinder had to be cleared of oversized aggregate, resulting in about two hours of lost production time every day. According to Mark Bennett, General Shale Brick's mining and grinder supervisor, "We would have to shut down the crushing circuit 10 to 15 times per day to clear oversized rocks out of the grinder." It had become obvious to Mike Stacy, superintendent of the Mooresville operation, and others at General Shale Brick that they had to change the way they were crushing the shale. The grinder had to go. "General Shale Brick has continually worked on automation over the last 20 years to produce more brick," commented Stacy. "We wanted a crusher that would allow us to come in, turn it on and leave it on without any downtime," added Bennett. With these criteria in mind, General Shale Brick's management decided to look for a crusher that was designed to crush limestone. They believed a limestone crusher would be able to handle the oversized rocks that inevitably came with the shale and had caused the grinder so much trouble. Photo, Before purchasing their new impactor, General Shale brick would shut the crushing circuit down 10 to 15 times per day to clear oversized rock out of its grinder. General Shale Brick had heard that horizontal shaft impactors from Stedman Machine Company based out of Aurora, Indiana were successfully replacing hammer mills in other brick operations. Tom Morehead, a General Shale Brick manager, and Dan Hayes, a grinding supervisor, began to investigate further. Stedman ran a material test sample through the company's full-size equipment test lab. According to Stedman's Joe Bennett (no relation), "We ran their [General Shale's] material sample through a field-size Grand-Slam™ T impactor to conduct the test. We only use full-size equipment in our test lab to provide the customer the most accurate evaluation and to assist them in selecting the right equipment for their application." Test results showed that a Grand-Slam™ GS 4260 with a 42 x 60-in. rotor would be capable of handling General Shale's larger 10 to 12 in. 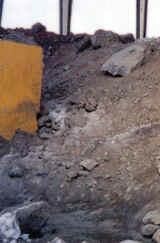 shale feed material, as well as the aggregate imbedded in the shale. General Shale Brick equipped its GS 4260 impactor with optional apron heaters. Installed on the impactor's feed chute and apron assemblies, the apron heaters minimize wet material build-up in the crushing chamber, reducing the need for maintenance to continually clean out the chamber. To help further increase the efficiency of the crushing circuit, General Shale Brick also uses a variable speed drive on the conveyor feeding the impactor. This drive system allows them to tailor the feed rate to match current material conditions. During the winter months, when the shale carries more moisture, material is fed into the crusher at a slower pace so as not to overburden the screens. When the material is drier, it is fed much faster to increase productivity. General Shale Brick quickly noticed a production increase after installing the new impactor. "The impactor averaged 53 yards per hour production during the first month in operation, and it hit 57 yards per hour the next," said Mark Bennett. That was considerably better than the American Clay 384 grinder's maximum average monthly production of 47 yards per hour. General Shale Brick's production goal with the Grand-Slam™ has been to average 60 yards per hour every month. This goal should be attainable since, according to Bennett, "There have been days when the Grand-Slam™ has hit 70 yards per hour." Photo, General Shale Brick quickly noted a production increase after installing the new impactor. The production increase has also benefited the other equipment in General Shale Brick's crushing operation. 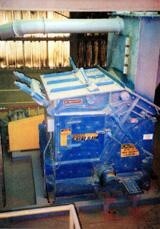 The operation has two side-by-side, 400-cubic-yard bins to store final crushed product, which ranges from 8 to 28 mesh. Material is pulled from one bin to make the brick while the other bin is filled with spec product. "With the Grand-Slam™ we can fill a bin in about seven hours, whereas it took 9 to 10 hours with the old grinder," commented Bennett. This has allowed Bennett's crew the time for routine maintenance on the entire circuit, rather than spending an entire shift making final product and hoping for no downtime. In addition, the new impactor produces more final product on the first pass than the old grinder, which, according to Bennett, "may be increasing the life of our screens, but we are still investigating this." When asked why he chose to replace the grinder after recently spending the time and money to rebuild the old grinder, Mike Stacy said, "It's simple. Every day that we operate the Grand-Slam™, we save money." With the new impactor, General Shale Brick's maintenance routine is now down to greasing the daily grease points and periodically checking the apron gap adjustments and breaker bar wear. The new impactor has eliminated the production stoppages for clearing oversized material. It has also eliminated the 55-gallon oil drum each month for lubrication; the $30,000 spent in replacement parts each year and the $10,000 each year in regular on-going maintenance time. Stacy estimates a quick payback on the new impactor when downtime, maintenance and the power it took to run the old grinder are added up. On top of the savings, Bennett is satisfied with the impactor's performance. "It is a lot quieter to operate, and it has made life a lot easier," Bennett said. However, the biggest winners of all may be Alvin Buis and Bill Sexton, who operate the crushing circuit and had to clean the jammed stones out of the old grinder. When asked about the new impactor's performance, Buis said with a smile on his face, "I have a lot less aches and pains."